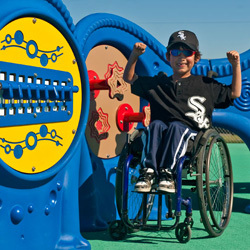 Landscape Structures Inc., a Delano, Minn.-based commercial playground manufacturer, is committed to providing A Higher Level of Inclusive Play™. That means they’re creating playground equipment and play environments that are not only universally accessible for those using mobility devices, but are also inclusive to children with autism, sensory-processing disorders and other learning disabilities. To address the issue that children with differing abilities often have trouble playing and socializing on the playground, Landscape Structures provides inclusive play experiences that meet all children’s needs in the same place in a variety of ways. Adding to its suite of inclusive playground products is the OmniSpin™ Spinner, which provides valuable vestibular stimulation and encourages children to interact with each other. The new Oodle™ Swing also offers vestibular stimulation while encouraging interactive play for many children. In addition, it provides an easy transfer point for children using a wheelchair or walker. Five sensory play panels that were launched with the Sensory Play Center™ last January are now available on the PlayBooster® and PlayShaper® play structures. These interactive accessible playground panels—Fun Mirror Panel™, Kaleidospin Panel™, Marble Panel™, Optigear Panel™ and Xylofun Panel™—help children develop fine motor and social skills as well as provide sensory, visual and auditory stimulation. Additionally, these five panels can be included in Weevos™ play system designs along with the Alphamaze and Labyrinth Panel™, Bongo Panel™ and the Imagination Table™. Landscape Structures has also introduced new configurations to two existing products, making them more accessibility friendly. The popular Molded Bucket Seat has a new design configuration that hugs children’s bodies more closely and includes a yoke harness to provide greater stability for those with limited upper-body mobility. And ramps are now available in a Double-Wide configuration. This extra room allows playground access for two wheelchairs to pass or travel together, and gives equal access for all children to play side-by-side. The playground industry has come a long way in providing universal access to play spaces, but experience tells us we must look beyond ensuring access to ensuring inclusion. Learn more about Landscape Structures’ Inclusive Play design solution and its new inclusive playground products.